We are the Kiczeks, a Catholic, pro life family, who are trying to work for the kingdom of God by bringing others closer to Jesus. As a family, we created Dolls from Heaven. Dolls have always been part of our family. We all enjoyed dressing them and playing with them. Last year, on the Feast of Our Lady Help of Christian, May 24th, we took a long trip to a family function, it was a long ride and there was a lot of traffic. After we prayed the Rosary, we started talking about the different kinds of dolls companies and how there were none that would inspire children to become saints. A little light bulb lit up in our heads, we all suggested creating a doll company that would lead children closer to God through the lives of the saints. We came up with the name, “Dolls from Heaven.” Once again, all of us in agreement decided that our first doll should be St. Therese of Lisieux. She is one of our favorite saints; she has not only inspired our family, but millions of people through her “little way. Our second doll is St. Joan of Arc and she was chosen by our customers. She has a very inspirational story, she teaches that nothing is impossible with God. Our third doll is the inspiring boy who became pope, St. John Paul II. We hope his story will teach children to "be not afraid" and foster vocations. Future plans for the company is to create a series of saint dolls like St. Mother Teresa, St. Bernadette, St. Francis of Assisi, St. Patrick, and many more. The plan is to introduce one saint per year. 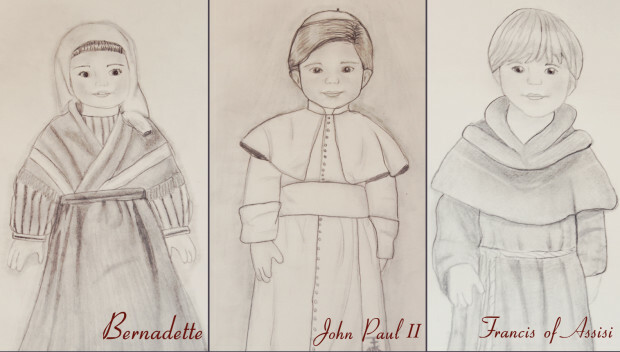 We created Dolls from Heaven with the goal of bringing young children Closer to God through the lives of the Saints. We hope that our dolls will encourage young children to make Jesus the focus of their lives.